Normally, I avoid pricey restaurants located in tourist trap areas like vegan restaurants (sorry vegans... I'm a meatarian). Something about paying top dollar for average food while waiting for a table amongst other tourists (won't catch a local eating there! ), could be cause for revoking my foodie card. 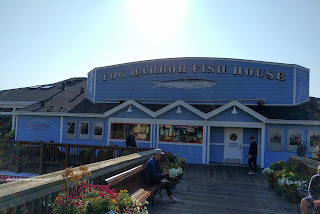 However, we ended up at Fog Harbor Fish House located at Pier 39 for a couple of reasons. First, our ferry brought us to pier 41 from Sausalito. Second, Cable Car Guy and Girl wanted to meet up with us for dinner and it seemed to get good reviews online. Third, it was kid-friendly (4 kiddies at the table!). I wasn't holding out for much, but to my utter surprise, the first dish was very good! 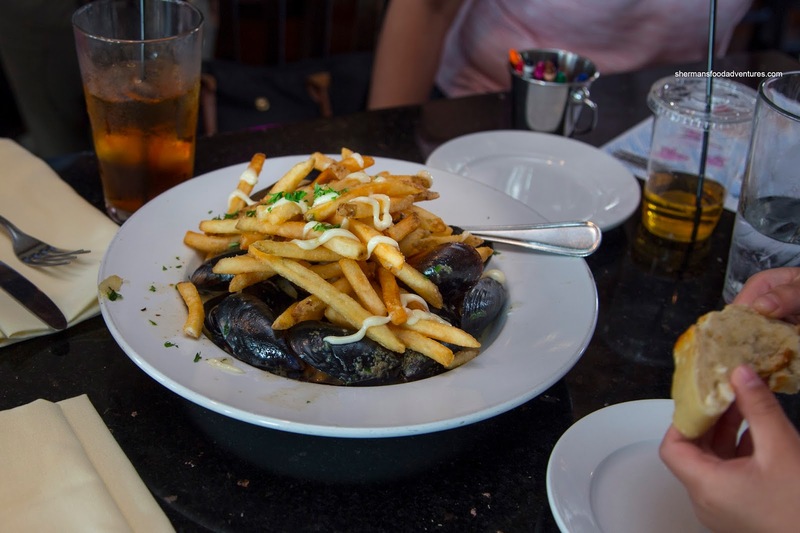 Seemingly translated directly from French, the Mussel Fries were on point and dare I say #lit? Each mussel was open and the meat was fat and plump. They were barely cooked through which meant they were buttery, tender and sweet. The sauce consisting of sambuca cream, shallots and fennel was in the background and didn't interfere with the natural brininess and sweetness of the mussels. We also ordered 2 bowls of their Award Winning Clam Chowder and it seemed to live up to its namesake. 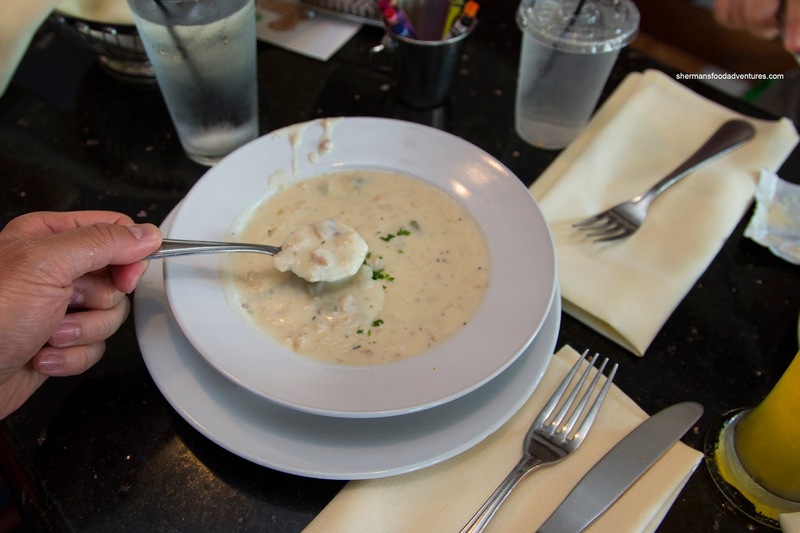 Although a tad on the thick side, it was creamy and full of potatoes and tender clams. There was a noted brininess to go with the sweetness of the broth. 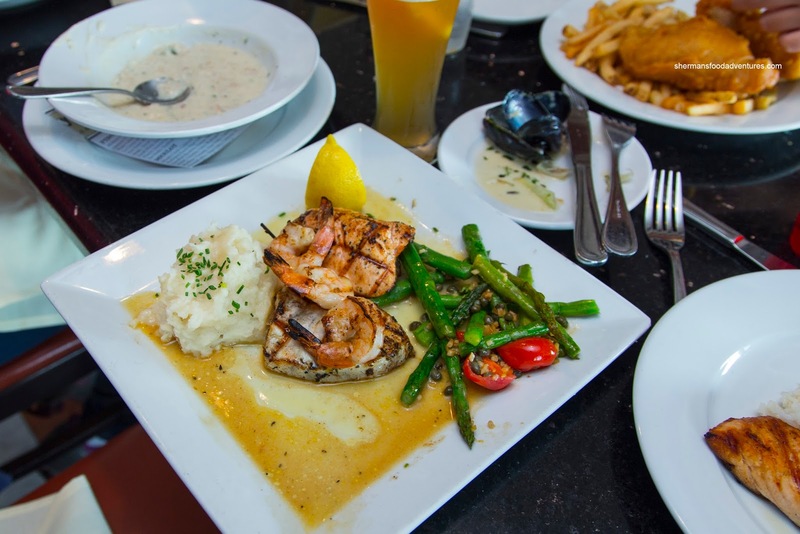 For myself, I decided on the Mixed Grill consisting of grilled salmon, swordfish and shrimp with citrus beurre blanc, asparagus and garlic mashed potatoes. 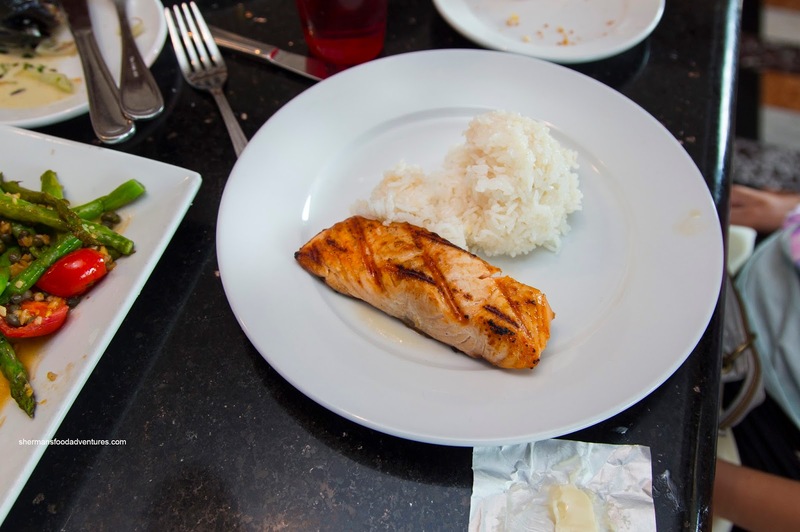 Once again, they nailed the execution of the proteins where the salmon was still pink in the middle while the swordfish was tender and flaky. They had been grilled enough on the outside for some smoky caramelization. As for the shrimp, they were meaty with a sweet snap. Even the sauce was nicely balanced as well as the vibrant asparagus. Viv had the Seafood Penne with fresh fish, clams, mussels and shrimp in a tomato cream sauce. By appearance alone, the dish was ho hum. 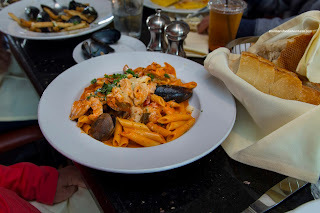 However, it ate decently with al dente pasta and again, on point seafood. I thought there was too much sauce in the dish, but it was tangy and creamy. Cable Car Girl opted for the Crab Roll featuring crab, celery and shallot aioli served on a buttered roll. 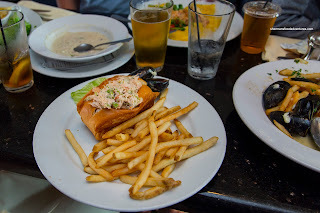 This thing was stuffed solid full of fluffy crab with only a modest amount of crunchy celery. I thought the aioli was mild-tasting with aromatics, but it could've used more acidity. The roll was soft and nicely toasted. This was worth the money in my opinion due to the amount of crab and overall execution. 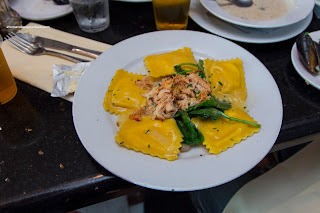 Cable Car Guy went for one of their Dungeness Crab Ravioli consisting of cheese ravioli simmered in a shallot butter sauce, with spinach, tomatoes and topped with fresh crab meat. We would've preferred the crab to be in the ravioli, but the generous amount on top was good. The pasta was al dente, but the cheese filling was a bit lifeless. 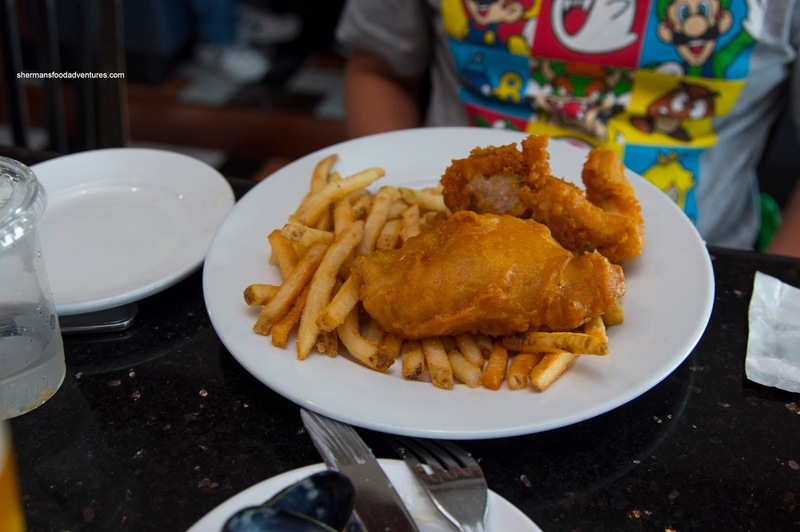 For my son, he had the kid's Fish & Chips which was actually quite the portion and didn't really differ from the adult size. Unfortunately, the beer batter was far to thick and dense, which was a tragedy as the fish itself was flaky and moist. Underneath, the fries were thin and very crunchy. They were more like crisps, but were good nonetheless. My daughter ended up with the Kid's Salmon with a side of rice and it was not bad. The salmon was prepared just as good as the fish in my mixed grill. However, as you can clearly see, the lack of sauce made the dish rather plain and dry. Despite the lackluster kid's meals, the rest of the items we had at Fog Habor were good and definitely bucked the trend of the typical tourist trap.